The UC San Diego University Art Gallery is pleased to announce, on occasion of its forthcoming 50th Anniversary, the arrival of Artistic Research: Visual Arts, a publication that serves as a catalyst for both present-day consideration and historical reflection. Incorporating the research of artists in the current Faculty Exhibition, it offers a cross section of the motivating concerns of the work on display; incorporating an inventory of the gallery’s exhibitions over five decades, it offers a chronological view of the institutional history that informs the present. Since its founding in 1966, the University Art Gallery has helped to advance scholarly work on the institutional and aesthetic frameworks that define artistic practice. It has helped synthesize forms of intellectual inquiry and creative production across the humanities and sciences. 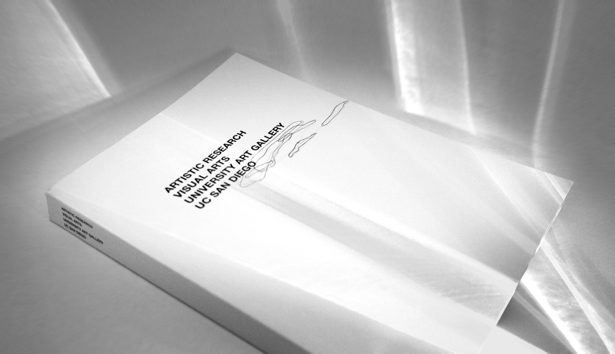 The gallery has been able to perform this function because of its unique constitution within the broader research environment of UC San Diego — a situation that has enabled it to present research-driven artwork in the context of the broader interdisciplinary environment that informs it. These unconventional works, in their traversal of institutional divides and practice methodologies, do not diminish the relevance of disciplinary traditions and the assiduities they require. Scholarly endeavors in the production and analysis of contemporary art are enriched through encounters with new cultural forms, as these forms benefit from engagement within the critical historical frameworks that scholarship provides. Artistic Research: Visual Arts foregrounds the vital role played by the University Art Gallery in fostering these artistic and scholarly pursuits from the unique standpoint of the UCSD campus — connecting environmental, technological, and urban research to the material specificity of the San Diego/Tijuana border region. Situated at the crux of disciplinary pathways and geocultural corridors that extend into Latin America along a trans-continental axis to the south and into East Asia along a trans-Pacific axis to the west, the gallery functions as a critical port of entry. The layout of the publication is intended to reflect this role. Each of the 226 exhibitions assembled within the pages of the chronology is situated as a portal that invites access to the undercurrents of research that the gallery has brought into adjacency within that particular frame — an invitation that the current Faculty Exhibition accepts. No interpretive content is presented, in order for the gallery to undertake the task of its own presentation, its own exhibition as a historical actor.